Raise LIVE Painted Lady Butterflies or Monarch Butterflies! 5 yr-old Dwight Smith of Beach Park, Illinois reared Painted Lady Butterflies with a butterfly kit. Parents are always looking for the coolest, most unusual gifts to give their kids that the children will love to receive and that they can learn from. 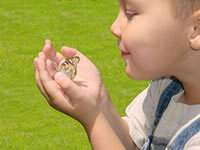 Raising butterflies is truly an educational experience that every child will want to do over and over again. You can take the kids on a hike to search for butterfly eggs and collect them, then make a home for them, being sure to provide them with the appropriate food for the caterpillars to eat, something for them to climb on and make their cocoon, and something for the butterflies to eat once they emerge. Make sure you have adequate fresh food growing nearby for your hungry caterpillars! Punch small holes in the jar lid, or cover the top with a fine screen mesh held on with a rubber band. Keep a damp paper towel in the container. Frequently clean the cage of frass (droppings). Replace the food plants as necessary, when the leaves have been eaten or turn dry. As the newly hatched caterpillars grow, they will need plenty of food and space. OR you can make it easy on yourself and buy a butterfly kit to raise Painted Lady Butterflies (although the hike to find the eggs in their natural habitat is a good idea, too, just don’t collect them). These kids got to observe live Painted Lady caterpillars turn into Butterflies. Teachers can buy a live School Size Painted Lady Butterfly raising kit. We offer several Painted Lady Butterfly Rearing kits, so that YOU can raise LIVE butterflies- watch the transformation of Caterpillar to Butterfly for education and enjoyment at home! Nature Store At the nature store we have butterflies for sale: several kits for rearing LIVE painted lady butterflies - from 5 to 33 caterpillars! 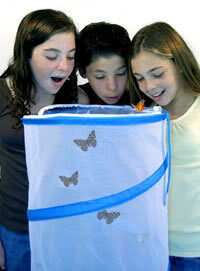 Our kits make Painted Lady Butterfly rearing EASY - simple directions and everything you need is included. Ages 4+. A fun gift for kids and adults, as well as a great project for home-schoolers and classrooms. Rearing Caterpillars By the Entomologist’s Society. About finding caterpillars,housing, feeding and more. How to Rear Butterflies and Moths All about rearing – habitat, food, water, cleaning, and handling. 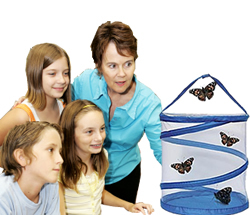 Rearing Butterflies at Home Website for children to help them through the rearing of butterflies in a simplified form (will require some adult supervision). Berkeley's Anise Swallowtails Lots of pictures of the stages of the Anise swallowtail's life cycle; emphasis on caterpillars and raising them, but butterfly pics as well. One of the best written and documented butterfly rearing sites out there. Also fun to read!! Swallowtail Butterflies Farm A LIVE BUTTERFLY RELEASE will make your wedding the most memorable event your guests have ever experienced! We are the LARGEST supplier of Live Wedding Butterflies and specialize in making your butterfly wedding perfect. We guarantee your beautiful butterflies will arrive alive and in time for your event. Butterfly Fun Facts - Butterfly Facts to Amaze Your Friends! Carnivorous Plant Kits: Fly Traps, More! © thebutterflysite.com. All rights reserved.